At some point, every single one of us has reached a point of frustration. A situation where we knew that we were having impact that was far less than what we were capable of. Large organizations are filled with smart people who have great ideas. Unfortunately, most of these people find themselves stymied in their ability to bring people to their full potential and ideas to fruition It doesn't have to be that way. 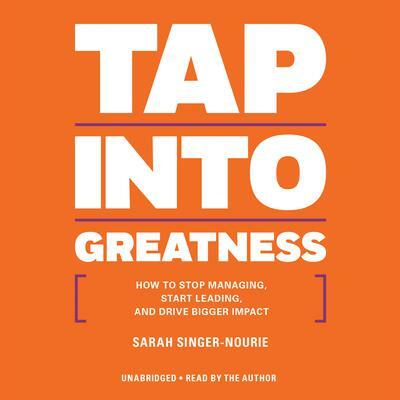 In Tap Into Greatness, noted performance coach and educator Sarah Singer-Nourie reveals the key truths of having outsized impact, influence and power. It turns out that most of us aren't leading. We're simply managing. We're getting things done, but we're not inspiring others to excel beyond what's expected. Great leaders know better. They know leadership isn't magic. It's not just something you're born with. Leadership is learnable. In this engaging and hands-on book, Singer-Nourie provides tools that have been developed over the last twenty years in her work with leaders and teams in corporate America, Silicon Valley startups, schools and non-profit organizations. The methodology is based on how people actually learn, rather than how most of us were taught in school. It leverages the insights of human motivation and the latest research in neuroscience to give leaders a roadmap for having impact.